Happy Independence Day!! As a former soldier I kind of geek out when it comes to patriotic holidays. It’s a time to reflect on those who have selflessly served to give others a better life. TMFCoverJulysmallWhen thinking of moms to feature this month I wanted to share women that reflect the toughness and enduring spirit that I think this holiday symbolizes. America is a country that has been knocked down more than once, but always gets back up and comes back stronger than it was before. I have trained soldiers in the Army and I have trained moms, and can honestly say that they are equally tough… though, I think I would rather come up against a soldier than an angry mama!There is a fight and strength in mothers that in unrivaled by any other being on earth. In this issue I am happy to highlight several of them who embody strength, fortitude and selflessness. 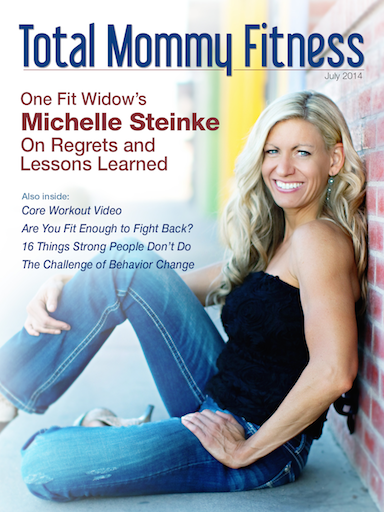 This month you will read about Michelle Steinke who suffered an unthinkable loss then used her grief not only fuel herself to become stronger, but also to help others going through similar situations. You’ll also read articles by Jennie Trower and Jarrett Arthur who have dedicated their lives to empowering women through self defense training and giving moms the tools needed to protect themselves as well as their families from harm. And, Karen Rabon who works full time and has raised over $100,000 for causes that are important to her and her family. All of these women are beyond impressive and inspiring. I hope that you enjoy reading their stories and advice, and draw from their strength and courage this month as you face your own obstacles. Click to download Total Mommy Fitness Magazine FREE in iTunes for iPhone and iPad, and in PDF format for all other devices.